One of the beautiful parks in Mysore, Happy Man Park is a popular hangout for both kids and adults. Lush greenery and captivating landscapes attract many visitors to this park. One can visit this park to spend a few moments amid refreshing greenery and soothing atmosphere. After a day of sightseeing, this park is an ideal place to go and relax. This park is a popular picnic spot where people can be seen enjoying and relaxing with their families. Children and adults both seem to enjoy their time here at the park equally. The main attraction of the park is the Laughing Buddha statue, happy man with a pot belly, on which the park has been named. It has been placed in the centre of the park. Mini zoo, which is located inside the park, is another major attraction here. Visitors can also spots ducks, hens and many other birds in the park. This park presents a perfect example of how human and animals can reside side by side without impacting each other adversely. Its natural beauty is also equally enticing. Along with captivating landscapes, this park also has wooden bridges and streams which add to its overall charm. Thoughtfully designed landscapes of this park present amazing excellent opportunities for photography too. So do carry a camera with you as this beautiful park makes for a mesmerising backdrop. Slow soothing music is also often played at the park, making the morning and evening walks even more pleasing. The opening timings of Happy Man Park are from 4.30 PM to 9 PM in evening. It also opens for a while in the morning when many morning joggers can be seen enjoying its serene landscape. Entry fee of Happy Man Park is Rs.5 for Indian tourists while it is Rs.100 for visitors from outside India. 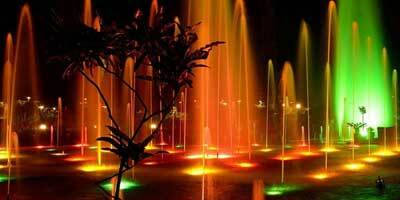 Happy man Park is located approximately 2-3 km away from Mysore railway station. It is situated near Kamakshi Hospital and is easily accessible. Tourists can hire a taxi or take an auto rickshaw to the park.